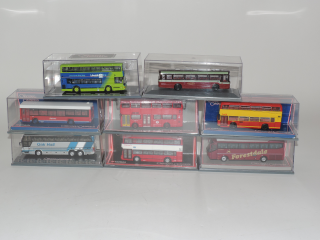 Corgi 1:76 8x Original Omnibus Company Mint in Box. 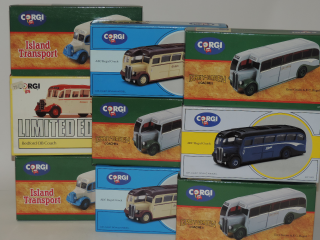 Corgi 1:76 8x Original Omnibus Company Limited Editions Mint in Box. 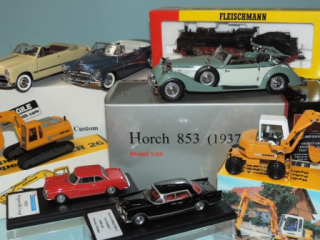 models from Leyland, Harrys, Bova Futura, AEC and others. all with Certificat. 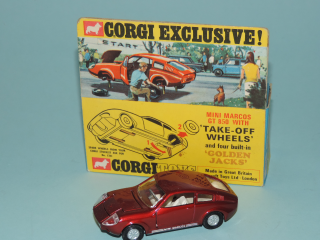 Corgi Exclusive 341 1:43 Mini Marcos GT 850. 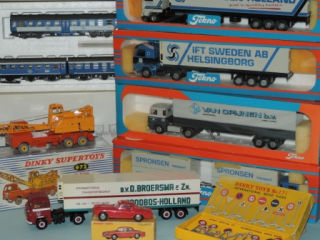 Near Mint in Good Box. 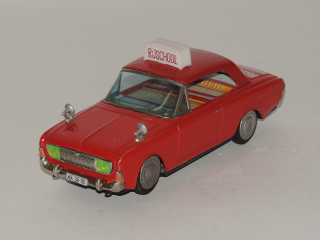 Ichiko Japan Tin plated Ford Taunus Rijschool in Good Condition. Item needs some repairs. The Battery Compartment is not fixated. Also the remote control cable for steering is not There. 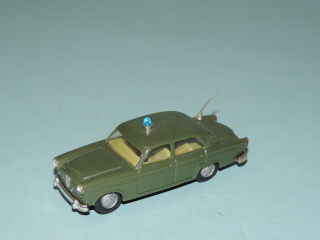 Politoys Italy 48 1:41 Resin Alfa Romeo Giulietta TI "Polizia" Excellent Plus, Should be Near Mint but Antenna is Re-glued with a big dot. 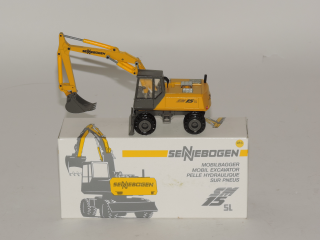 Conrad 2817 1:50 Sennebogen SM15SL Mobil Excavator Near Mint in Box. 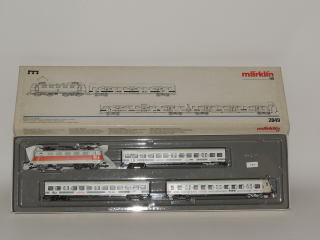 Marklin 2849 H0, S-Bahn Train set with Electric Locomotive DB Near Mint in Box. USED. This item is Converted with Digital Plus LE1025A by Lenz. 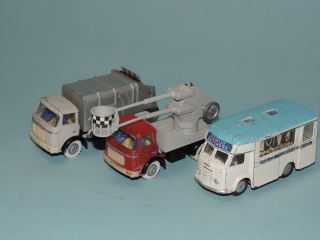 Lesney, 6x Vintage models with Grey Wheels Excellent #35 Marshall Horse Box MK7. 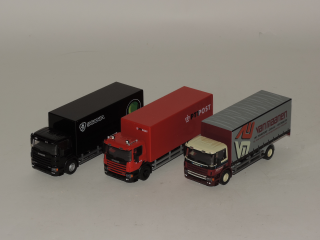 #28 Compressor Truck. 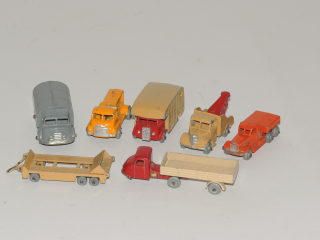 #15 Bedford Prime Mover Tractor with No.16 Low Loader. #13 Bedford Wreck Truck. #10B Mechanical Horse. #38 Karrier Refuse Collector. 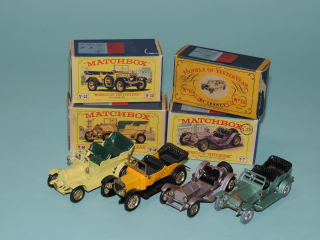 Matchbox 2 Gift Sets M-6 en M-9 Mint in Box. 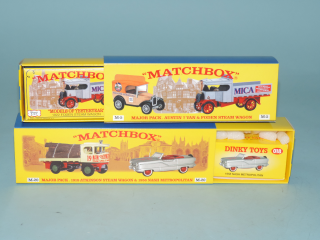 Matchbox 2x Gift Sets, M-5 Major Pack: Austin 7 Van & Foden Steam Wagon and M-20 Major Pack: Atkinson Steam Wagon 1918 & Nash Metropolitan 1958. 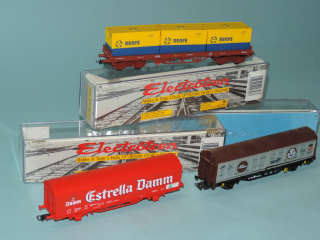 Mint Internal boxes and Outdoor boxes. 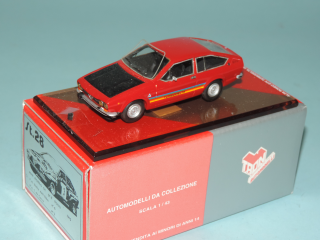 Tron Italy ST28 1:43 Built Kit Alfa Romeo GTV Turbodelta 1978, Excellent in box. 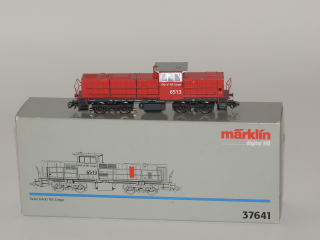 Marklin 37641 H0 NS 6400 Cargo Diesel Locomotive Near Mint in Box. 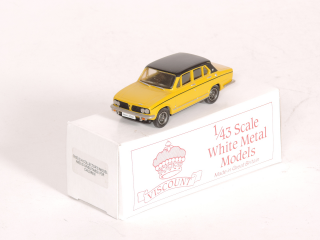 Motorart 1:50 and 1:87 Die-Cast 2x Volvo Near Mint in Box. Motorart 1:50 and 1:87 Die-Cast 2x Volvo Near Mint in Box. 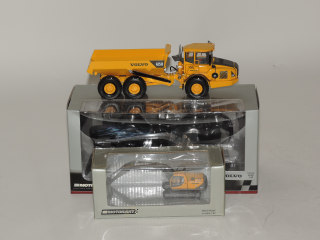 #10449 Volvo A25D 1:50. #13043 Volvo EC210 1:87. 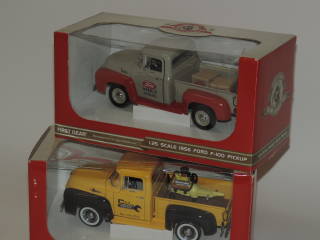 First Gear 40-0047 and 40-0063 1:25 Ford F-100 Pickup Trucks Mint in Box. 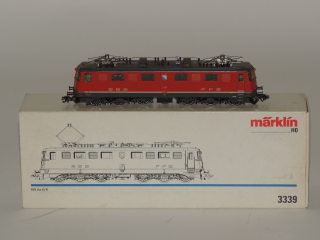 Marklin 3339 H0 BR Ae6/6 Electric Locomotive FFS/CFF/SBB Near Mint in Box. 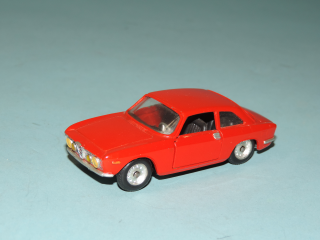 Minichamps 1:43 3 Alfa Romeo Rally models Mint in Box. 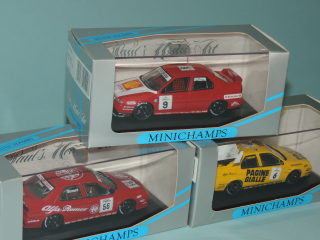 Minichamps Pauls Model Art 1:43 Alfa Romeo Rally Models. #430 941256, 1994 BTCC G. Simoni. #430 941206, 1994 Class 2 Italy A. Tamburini. #430 941209 1994 Class 2 Italy S. Modena. 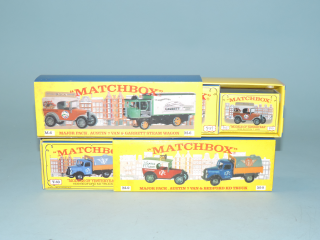 Mint in Near Mint boxes. 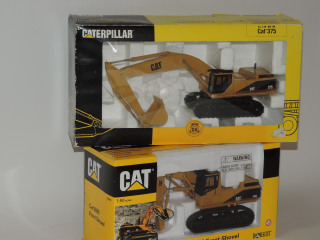 Joal and Norscot 1:50 2x Caterpillar Shovel Excavator Near Mint in Box. #Norscot 55004 CAT 5080 Front Shovel. #Joal 189 CAT 375 Hydraulic Excavator. 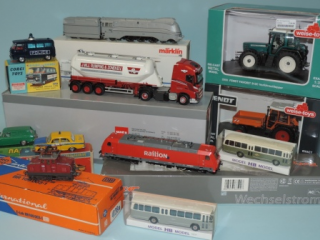 Gorgi and FJ France Jouets 2 x, Berliet GAK Refuse Lorry, Berliet GAK Elevator (missing figures) and Corgi 413 Smiths Karrier Bantam Mobile Butchers Shop. Good, No Boxes. 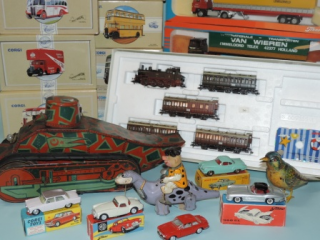 Corgi 1:50 Die-Cast, 9 Different Model Coaches Mint in Box. #97189 2x AEC Regal Coach Oxford. #97101 2x Bedford OB Vics Tours. #97180 3x AEC Regal Grey Green Bognor. #97190 AEC Regal Ledgard Private. #D949/23 Bedford OB Howards Tours Whitby. 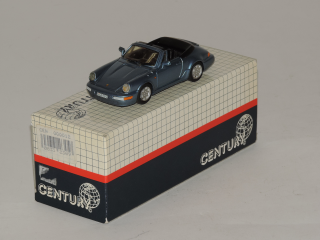 Century 20 1:43 Posche Carrera 4 model 1989 Near Mint in Box.